A few days ago a friend came across an article in, WhereItzAt Magazine. In the magazine was an article, “In defense of Black Bookstores,” addressed the loss of Black bookstores and why it mattered. This is an issue I’ve covered extensively. Indeed, I have published a directory of Black owned bookstores for as long as I have run this site. My current coverage of Black owned bookstores is probably the most extensive coverage available on the web today. So it goes without saying that I applaud WhereItzAt Magazine’s coverage of this important issue. 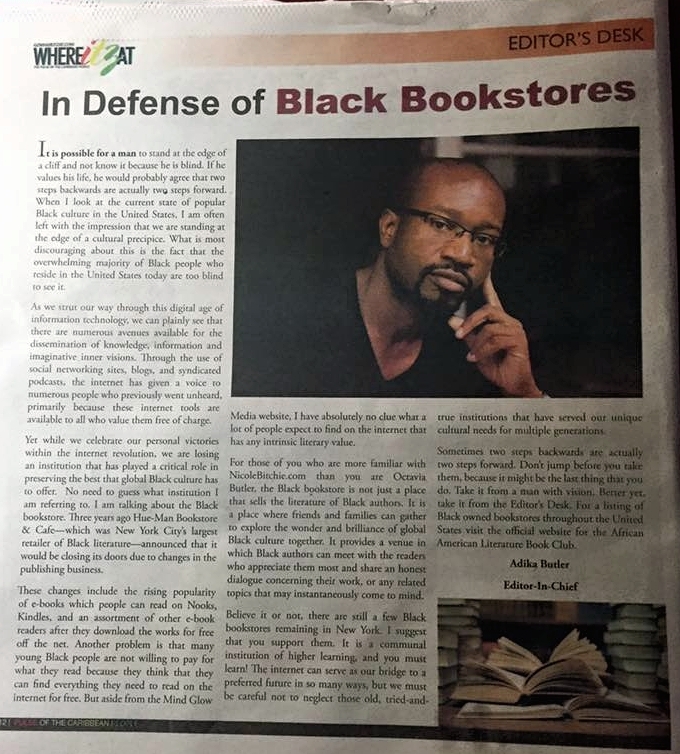 My friend took a photo of the article (shown below) and shared it with me, because AALBC.com’s website was mentioned as a resource where one msy find a list of Black owned bookstores. Of course I was interested in sharing this article, but I decided to look for an online version which would make it possible for others to more easily read. I found the article but noticed that the online version did not mention AALBC.com at all?! This just struck me as simply dumb. Why would the website not mention and link to an online resource to help readers discover the remaining Black owned bookstores—the very thing the article is purporting to support? They were obviously aware of the resource; why would they decide to exclude it on the online version of their article? I still shared the article, because the subject is important. In fact, I even added WhereItzAt Magazine. to my listing of Black owned magazines. I also added their website to my Huria Search engine which allows people to search Black owned websites exclusively. Now, while I’m using WhereItzAt Magazine as an example they are the norm—and this is our biggest problem. Stated plainly, Black websites do not link to each other. To illustrate this point, lets run a Huria Search on “aalbc.” Again Huria Search’s only goal is to elevate Black websites by making their content easier to find. In fact, the websites I own, including AALBC.com, are not included in the hundreds of sites that are indexed in Huria Search. If you examine, the top results you will see that most are two years older or more. There are none from the largest Black websites. The one search result from a top Black website was Black Enterprise Magazine, where they credited AALBC.com for an image that they copied from my website. Even here Black Enterprise they did not actually link back to the the AALBC.com page where they grabbed the image (looking at the page today, Black Enterprise even removed that reference). You’ll also see from that query that there are 13,000 results. Which may give you the impression that there are many links back to AALBC.com—and there, but they tend to be older links. The problem I’m describing is relatively new. Well some webmasters have been convinced that linking to other websites hurts their website: Some feel linking to other websites encourages people to leave their website. Others feel by linking to a potentially lower “quality” websites, hurts their website in terms of search engine optimization (SEO). Of course there is the problem of the site they link to removing the page in the future, creating a broken link on their website, which is bad for SEO and the experience of their visitors. But all of these reasons can be addressed—particularly by webmasters interested in the health and vibrancy of the Black web. Relying on social media, or search, to elevate our sites and make them discoverable, is simply not working. To compound this problem, when webmasters started linking to other websites, they began linking aggressively to social media websites. The result is that collectively we are uplifting social media and marginalizing our own websites. This problem is further exacerbated by Google (who handles the majority of searches), whose search algorithm looks at our behavior, of linking to social media and not linking to Black websites, and makes the reasonable conclusion to elevate social media over Black websites in search engine results. All of this has had disastrous results on the ability of websites to generate traffic and survive. As a result, the web is far less rich—particularly as it relates to content generated by and for Black people. We have lost some terrific website and potentially great ones are discouraged from even starting because of the difficulty of attracting visitors. If you have read this far, I suspect this article has resonated with you. If so, there is something you can do: Take every opportunity you have to link to another website. You don’t need to have a website or blog to do this. You can link to and share links to websites from your social media sites—a hyperlink to a website is much better for a website, than tagging or liking that website on a social media platform. If you read an article which has a place for comments, and feel another website offers a related resource, link to that website in the article’s comments section. Of course if you appreciated this article share it by linking to it or using the social media icons shown. Immediately after publishing this article, I connected with the publisher of WhereItzAt Magazine; not only will they update their “In defense of Black Bookstores,” article to add a link to our bookstore database. They have also expressed an interest in collaborating. I’m pleased WhereItzAt Magazine received the article as intended. I also look forward to working with them in a more constructive, and mutually beneficial, fashion. As a result, you the reader, will be much better served.